Our research is concerned with the computational and theoretical investigation of the structure and dynamics of complex interfaces of chemical relevance; colloids, biopolymers, membranes and nanomaterials, which form the buiding blocks of soft materials. The interfacial physico-chemical behaviour often confers striking properties to these materials, by mediating and promoting a whole range of chemical processes. One of our main areas of interest is the investigation of transport phenomena at nanoscale interfaces. 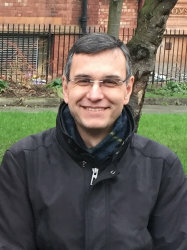 Current efforts are directed towards the development of computational tools to quantify energy transport across these interfaces, and the application of these tools to design high performance materials for energy management problems (e.g., super-insulating and highly conductive media) and nanomaterials with chemical and medical applications (e.g. catalysis, medical therapies). We are particularly interested in the investigation of novel physical concepts for energy conversion and energy recovery applications (e.g., recovery of waste heat). We have discovered that thermal gradients can polarize water (se Phys. Rev. Lett. 101, 020602 (2008)). This can be a particularly strong effect at high temperatures. The physical origin of this effect is connected to the coupling of a polarization current and the heat flux (see e.g., the Synopsis Polarization in Hot Water published by the AIP). We are currently investigating the relevance of this effect in practical applications as well as in the general area of thermophoresis. This thermal orientation effect is also observed in other molecular structures as shown by coarse grained simulations (http://dx.doi.org/10.1103/PhysRevLett.108.105901). In our group we combine non-equilibrium and equilibrium computer simulations, non-equilibrium thermodynamics theory and experiments to investigate the equilibrium and non-equilibrium response of soft matterials. Each year, the Department of Chemistry awards 10 Chemistry Doctoral Scholarships to outstanding PhD applicants. Successful Scholars will receive full tuition fees and a stipend at advertised EPSRC rates for a PhD place in the Department of Chemistry at Imperial College London. We welcome applications from dedicated and talented students, with the drive to conduct PhD research. Eligibility: Applicants should be a U.K. citizen or an EU national who has been in the U.K. for at least 3 years. (Back) Juan, Anna-Sofia, Fernando, James, Kaspars, Bjorn, Goran and Niall. Not in the picture: Stephen, Yash and Chris (Trondheim). From right to left: Anders, Ryan, James, Wendy, Silvia, Anna Sofia, Irene, Jeff, Niall and Fernando.